Just a quick blog to let everyone know that Tim and colleagues from the ADS will be at the CIfA conference in Leeds later this month. 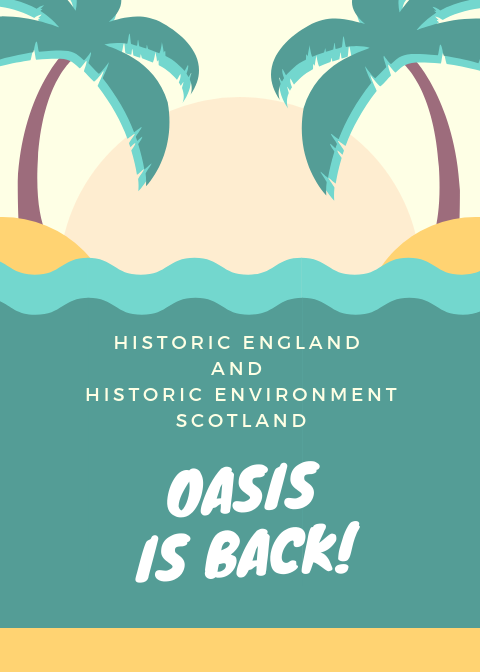 There will be new information on the OASIS redevelopment project available from the ADS/Internet Archaeology stall, including some new promotional material . Please come and say hello, we’re more than happy to answer any questions about what’s going on with the project. Tim will have a laptop, so (wifi permitting) he’ll be able to show you the current form as it stands! 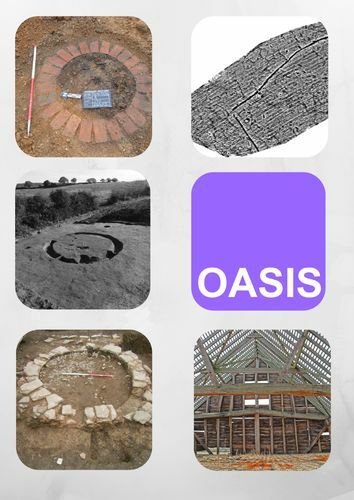 In England the ADS (via the Historic England HIPs team) are currently asking HERs about their preferred level of engagement with OASIS. This is because in the new OASIS system we now have three tiers of recording instead of just one: OASIS Lite, OASIS Standard and OASIS Plus. [Note: that in Scotland, because of the the workflow designed to communicate results to HERs, HES and DES, OASIS Lite will not be an option. The HER (Level 2) is actively participating in OASIS and wants to hold reports and metadata for review before they are available to the public. So, the Level 1 user fills in the mandatory fields for OASIS standard and uploads a report. Once everything is completed the HER has a window to review, or highlight records are held for extended review. When review is completed the report and metadata go into the ADS Library. OASIS LITE is a mechanism for uploading project reports to the ADS Library. OASIS LITE only applies to the areas of the form which are relevant to transfer to the HER (i.e. not the archive section which will be dependent on participation by the museum/archive rather than the HER). OASIS LITE will only be available when there is an HER for the area and that HER is collecting the full event record by other means (i.e. not via OASIS). All other OASIS modules which are relevant to that event/project will be collected even if the HER is not using OASIS i.e. Archive and Geophysics. Any reports that are released into the ADS Library through this mechanism will have a very clear disclaimer explaining that they have not been reviewed by an HER. The text of this disclaimer is being written by ALGAO executive with input from HE/HES. What are the mandatory fields for OASIS Lite and Standard? Can an OASIS Lite have more than the mandatory fields recorded? Yes, if the Level 1 user wants to, they can fill out as much as they want. Why are you asking now? As part of the package of work establishing the review and extended review (i.e. how long an HER using OASIS Standard has to review a completed record), we need to get an idea of the split between Lite and Standard users. We also need to have the participation level set for when we start testing workflows for Standard and Lite. Can an OASIS Lite HER still log in and see records/export data etc? Yes. They still have access to all the data for records in their area, with access to any exports and API functionality. Can the level of participation be changed? In short: Yes. The HER user simply clicks a button in their admin panel. In more detail: when the record is started it is defined as Lite or Standard in the database, a separate audit table also records when a record is saved, mandatory fields present depending on level (i.e. “complete”), report transferred to Library and so on. This will be reflected in what the user sees in their list of records. If an HER swaps from Lite to Standard there is a good chance the HER could suddenly get records to review, but only ones which hadn’t been defined as completed already and transferred to the library. This will mean however that a Level 1 user will be presented with increased requirements for any records that have been left open. However the differences in mandatory metadata requirements are not onerous, the main impact will be on the timing of transfer of reports into the ADS Library (i.e. any live or new records will be subject to HER review). If an HER swaps from Standard to Lite then completed records will be unaffected, incomplete records will simply have less for the Level 1 to complete as mandatory and report transfer will default to no review. That’s the plan, however we will be reviewing how this works in practice! If I change from Lite to Standard, can I edit completed Lite records? Yes. However you can’t request that a Level 1 user goes back and edits as they have completed what was required of them at the time. The record will still be marked as a Lite record, reflecting its original status. We have identified a potential issue where a Level 2 user switches to Standard, and then may want to start correcting or amending completed Lite records for their area. If an HER wants to go and add or edit that’s fine. Any OASIS record is always open, so additions or corrections are fine. The only sticking point is the report…. When a report and its metadata are transferred into the ADS Library that version is what’s archived as a point-in-time exercise. 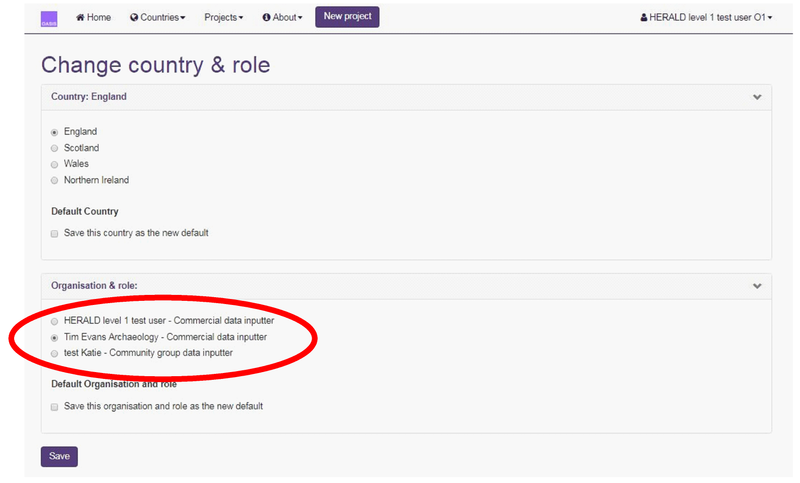 If an edit to report metadata is required it can be made by either the Level 1 user or HER responsible for that record directly in the ADS Library (we have created a module to do this!). This will need care, but basically there will be a system where accredited users can update Library records themselves without making a request to the ADS. Hopefully because of the new functionalities in the data entry form there should be many fewer errors in the basic bibliographic record, but we have to be prepared! The HER simply uploads the correct version of the report, both versions of the report are online (the first with a disclaimer). 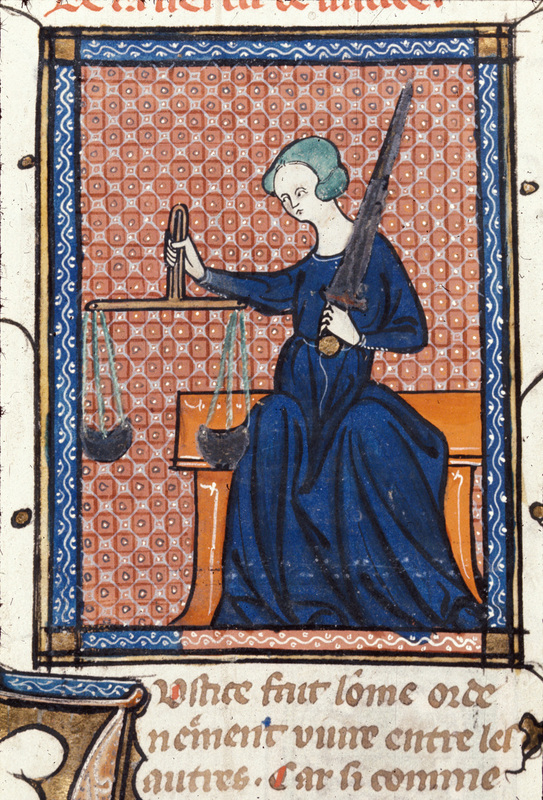 Potential to have links between the two records so that a user finding the first, is aware of the second. The HER finds the report they want to remove in the ADS Library, and flags it for removal/hiding. The ADS are then notified and the report is removed. Level 1 users will also have the ability to flag reports for removal (please note that if a report is deleted, the DOI remains, but just points to a landing page notifying the user that it has been removed). It should be noted that the above are options, and nothing is completely set in stone. 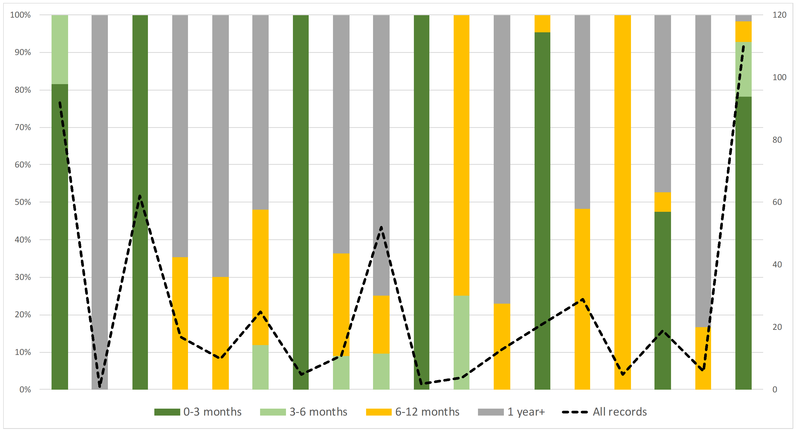 There’s a a balance between creating a system that allows the upload of reports in a timely manner and the ability to fix genuine mistakes or remove sensitive information, with the risk of having a system that becomes a mechanism for a constant cycle of upload-removal-upload-removal of different versions of the same report by different people. 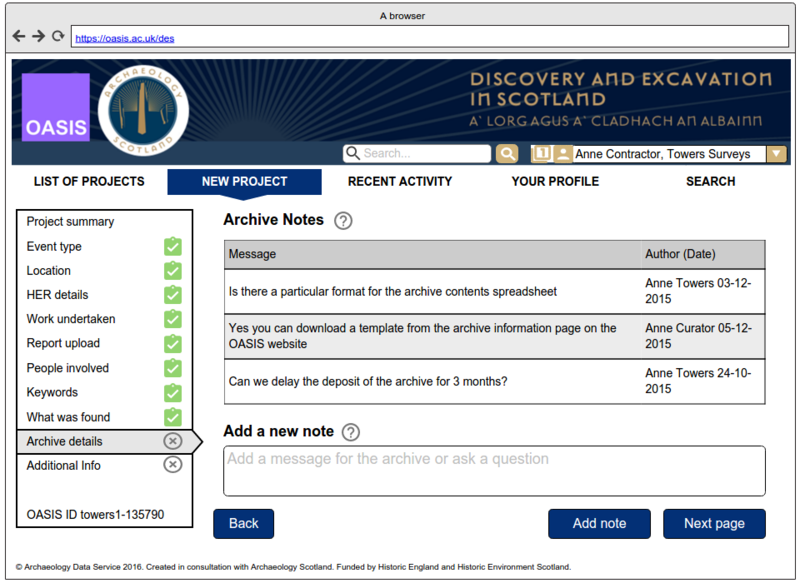 Reflecting the differences in archive workflows in England + Scotland. One of the problems with the old OASIS was that records were often completed whilst the archive was still in flux. Looking over many records you can see cases where archive location is “TBC” or “Intending to send to…”. There’s also a inconsistency in naming the organisation, and a great deal of uncertainty in what people are recording is in the archive. It’s not all doom and gloom, there are some really good examples (everything neatly recorded, archive named, museum accession code in place) that show that the willingness to record the archive properly is in place among many archive users. The first thing we can do to help is to have an OASIS form permanently open. So if the allocation and deposition of archive is on a separate timeline to the rest of the record (as often seems to be the case), then it’s a simple matter to have a user return and complete when things are sorted. 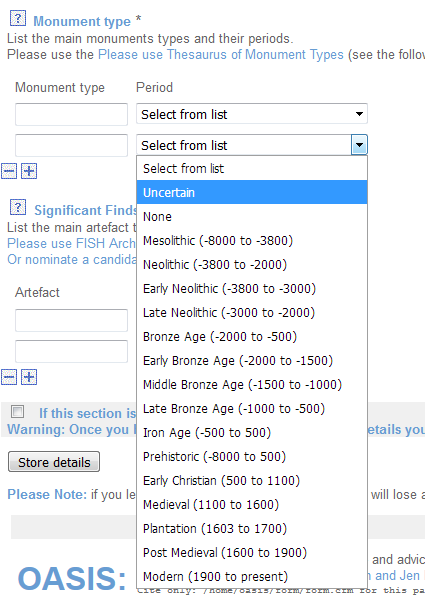 That’s especially true in Scotland where (at the time of writing) the allocation of archives is decided via the Scottish Finds Allocation Panel as Treasure Trove – although people may have an idea of where things may be deposited based on past examples, the archive part of OASIS needs to stay live so that it can be updated where needed. 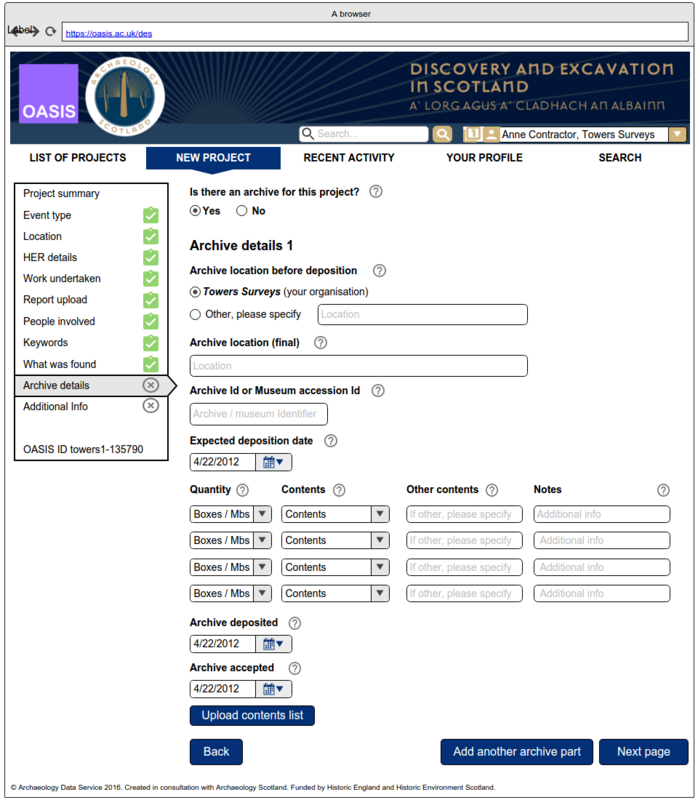 The other thing we’re doing is to have the curators involved (as much as possible) from the outset – archivists can create their own OASIS accounts, create their organisations, upload guidance on workflows, attach pro-forma and so on. This is a big step for OASIS to take. Historically OASIS has just been used for data producers, HERs and national bodies (a consequence of its origins as a simple event recording system). 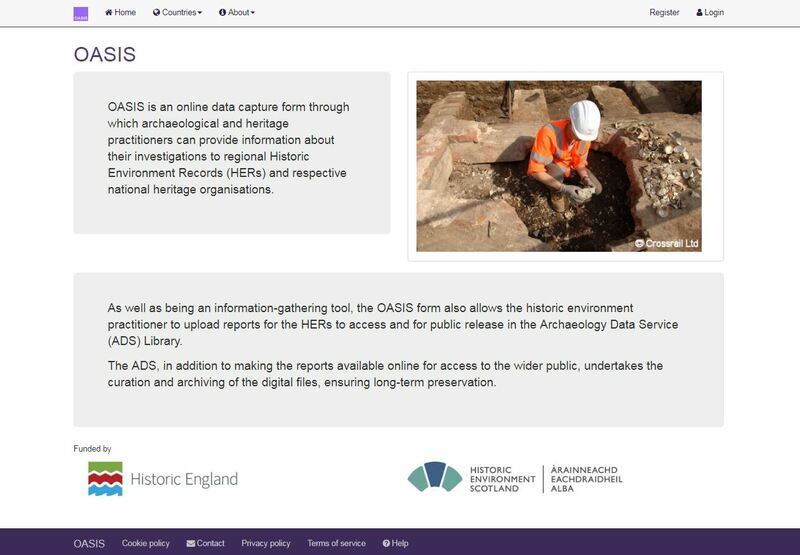 And while over the years we have created bespoke views for particular data consumers (where appropriate) it’s clear that for OASIS to truly succeed in it loftier aims for tying together all parts of the Historic Environment, it really has to get archivists engaged with the system. So what functionality are we looking at introducing? The ability for a Level 3 user to set their geographic collecting area. This may be county based, regional even national. 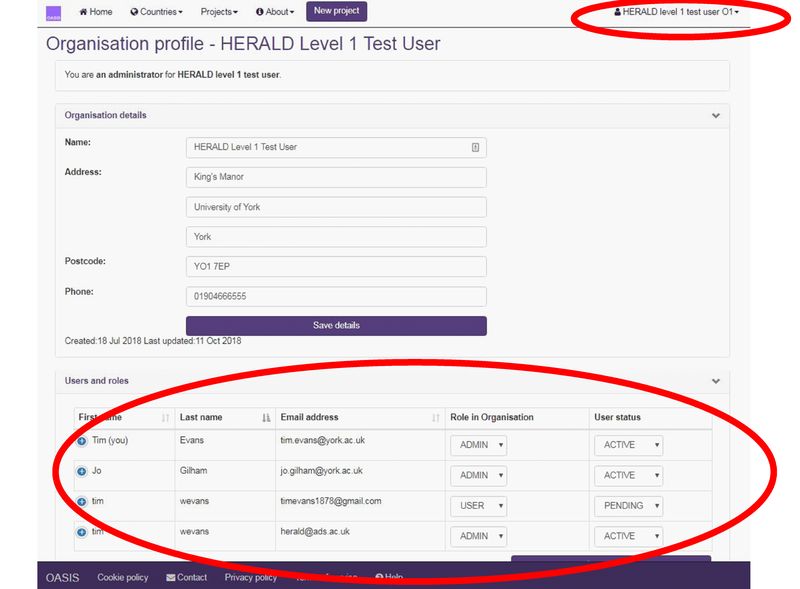 An example of the OASIS form recording correspondence between Level 1 + Level 3 users about archive guidance. Please note, this is not definitive but just to give an impression. In Scotland, when the archive was sent to SFAP, and the decision of the Panel as to appropriate course of action. There’s also space for a contents list of pro-forma template if required by the archive. A mock-up of basic functionality in the main archive page. Please note, this is not definitive but just to give an impression. However that still leaves the written, drawn and digital side… An initial list called ‘Paper and Digital Archive Component’ recording basic concepts such as, stratigraphic matrix, section drawing, photogrammetric model etc has been established courtesy of the Historic England’s DSU and reviewed by FISH. The list – to begin with – is deliberately simple, and there’s still plenty of time to review and propose additions to the list. As ever with a development project on a relatively short timeline – we want to get the basics working first. Have a list of organisations + data ready to use in the next phase of testing. 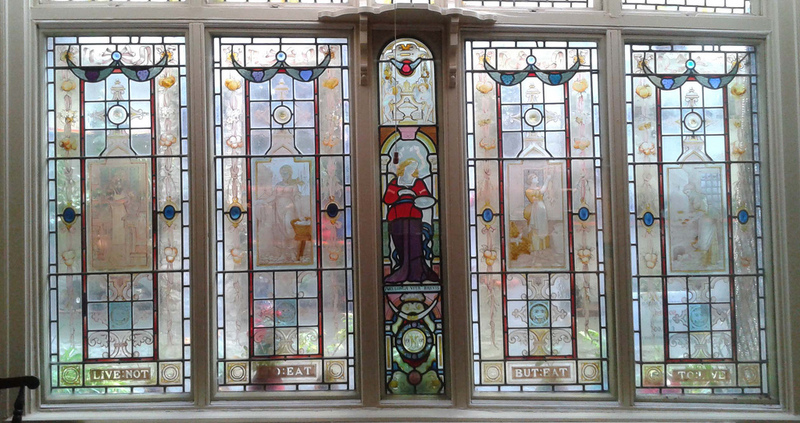 To begin with we’ve compiled a list of museums maintained by the SMA (see https://doi.org/10.5284/1018089) along with the list of organisations listed by The National Archives. For each one – and where available – we’ve used details such as location, whether they’re collecting, website, collecting area and so on. Although very rough, this is enough to start planning and then testing these specific Level 3 workflows. 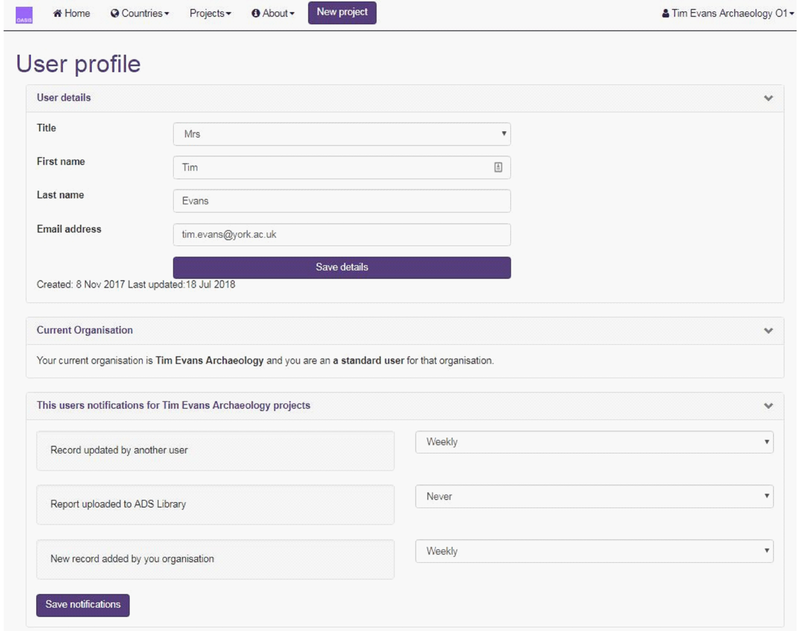 In the current system logging in is done as an organisation – all users within this organisation (for example My Archaeological Unit) log on with the same details. But what about where there are lots of people, and what if these people are split between regional offices, and what happens when one person forgets the password? What happens when someone leaves? 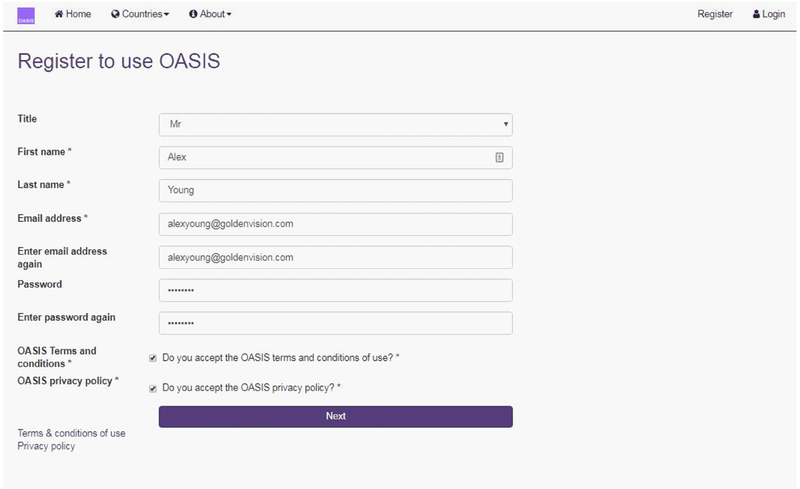 Do we change the password, or rely on the individual to forget it (admittedly I’m sure everyone has much better things to do than logon and sabotage OASIS records, but the principle remains)? The solution is to move to a system where every individual has their own logon credentials, but then the real complexity starts as we have to factor an individual moving jobs, having more than one job/role and for these roles to have different administration rights. For example, in a hypothetical situation I may start off working for Anfield Archaeology in a role that involves me creating and editing OASIS records for my projects. Then I move to Goodison Archaeology and take over pre-existing projects: the system needs a process to stop me seeing Anfield records (commercial sensitivity etc), but to have access to Goodison records. 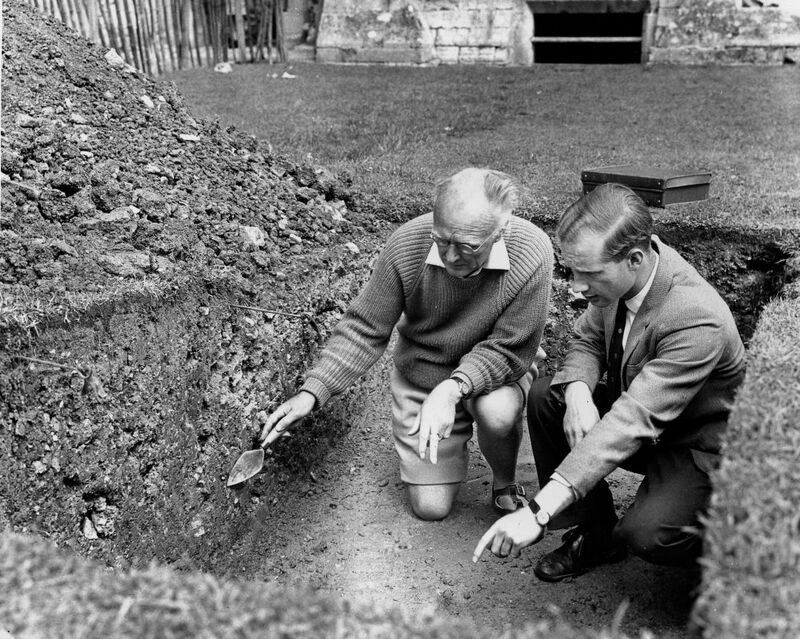 Whilst in my new job I do some work with Spellow Archaeological Society and offer to help them fill in some archaeological records, as an experienced OASIS user I volunteer to set up this group in the system and become an admin user, but at a later data want to pass on this responsibility to someone else. I’ll stop there, but the the myriad of potential roles and responsibilities – and these are things identified by OASIS users in the survey – are enormous. So now we’re no longer just dealing with a log on page, but a full-blown user management system. This is what Jo’s been hard at work on over the Summer. Explaining what she’s done in prose is overly long, so here’s a few screen grabs to demonstrate the main principles. Please remember this is the first draft version of the form, things aren’t set in stone and these grabs should be used for illustrative purposes only. Slide 3: Here I can change my name, I can also see that I’m a standard user for the organisation (so no admin rights). Further down the screen I can set the frequency of notifications I receive from OASIS. Slide 4: If I go back to my home-page, I can see that I’m also registered with two other organisations. In this case I want to go to my work with “HERALD Level 1 Test User”. Slide 5: I’m now “in” the system as this other organisation, I can see which organisation I am by the notification in the top-right corner of the screen. If I look at the organisation profile I can see the list of users registered to this organisation. I can see and edit this section this as I am a registered ADMIN. In this example you can see that the user timevans1878 has registered for my organisation, but their user status is set as PENDING. People asking to join an organisation and see their records have to be vetted by an ADMIN, which in this case can be any of the 3 users with these privileges (note: there can be as many admins as needed). Slide 7: If I click this I come to a screen where I can start searching for other registered users, I start typing in for my colleague Julian Richards and I can see that he’s in the system. I select him and can either add him as a Standard or Admin user. Important to remember that I can do this due to already being an ADMIN. I can downgrade my status at any point, although the system will always require 1 ADMIN user. Slide 8: I can also leave an organisation if I wish, so simply go back to my profile and I can see that I’m still registered with “Tim Evans Archaeology” and “test Katie”, but can leave as long as I’m not the sole admin. You can also see that I can apply to join other organisations. Slide 9: this all assumes I’m already registered. If I’m new to OASIS I can apply to register instead of logon. In this slide I’ve just been asked to register using my email address. However having done so I’m reminded that tim.evans is already registered as an OASIS user, I then get the usual reminders/reset. This is to try and stop (as much as possible) duplication within the system. An interesting facet of this work is our aim to coordinate OASIS users logon details across all main public facing applications hosted by by the ADS (OASIS, Library, ADS-EASY). Jo has been hard at work wrestling with things such as composite persistence modules (no, me neither) to reach a point where a user just has one set of ‘centralised’ credentials. So, no more logging in/out of different systems. Slide 12: So off I go and create my new organisation. The system does check to see if “Steve Puffin Archaeology” already exists to try and stop duplication. Providing it doesn’t, the new account is created and I’m automatically the ADMIN for this group. The world of OASIS is now my oyster. As the nights begin to draw in, it seems like an opportune moment to reflect on the progress of the redevelopment of OASIS. 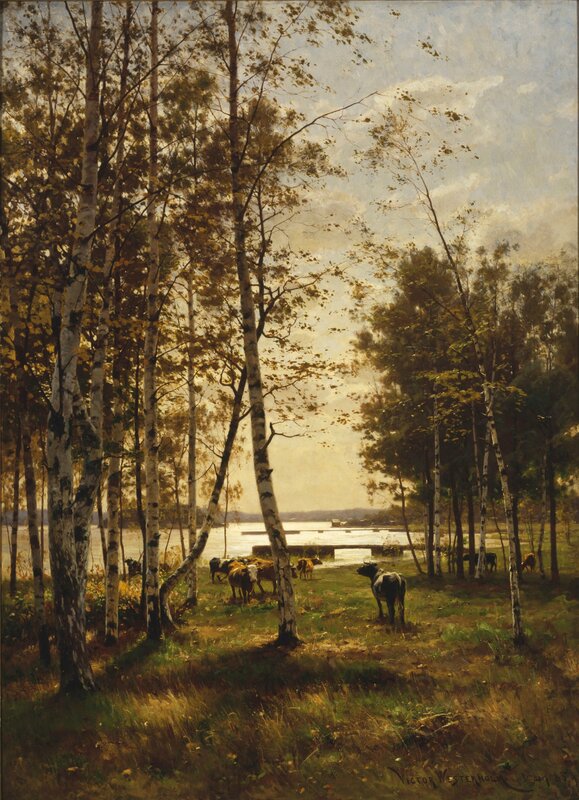 The Summer has perhaps been atypical here, usually it’s something of a hiatus between the rushes of finishing things to meet the end of a financial year/going on holiday, and beginning afresh in the Autumn. Not so this Summer, and it seems like myself and Jo have been busier than ever, but what have we been doing? The first part of this blog is to try to give an overview of the non-technical tasks, I’ll be writing up the development team’s work on the actual form as a second part shortly. Hopefully readers will have seen the alert for the small user needs Survey in September. This has now closed and the results are being written up to feed back to HE and HES on the resources that will be needed as we move into Stage 3 of the project (the actual roll-out of a real, live system). There was some valuable feedback, particularly on the value many users placed on having a human presence to help with their queries, greater input into training/guidance from people that actually use the form in day-to- day workflows (so not me! ), and to ensure support for users in remoter parts of the country. I’ll write a longer blog on the results in the near future. Elsewhere, we’ve also completed a task to ensure that the new system incorporates the highest standards of recording. As users of the current form are no doubt aware, there have long been problems with ensuring the accuracy and consistency of things being recorded in OASIS (a consequence of the age and original purpose of the form, but that’s another story). During the first stages of the redevelopment project exactly what is being recorded and how it is being recorded, came under scrutiny. 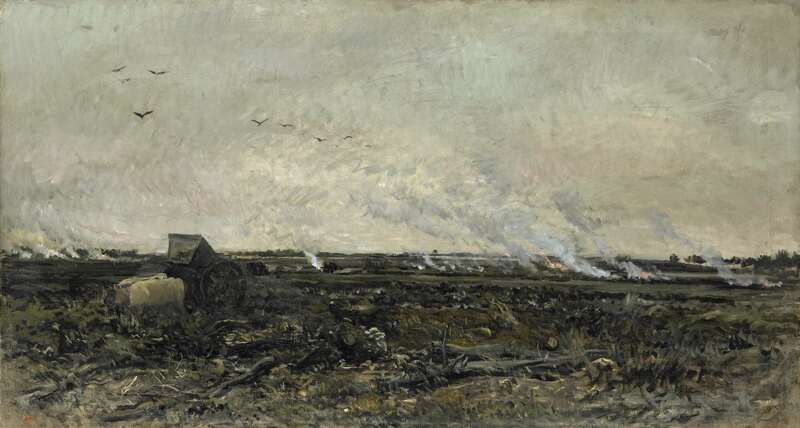 The result is that some fields have been dropped, others merged or rationalised. A full list of what remains can be seen in the Functional Specification which is available on the HERALD project wiki for those that wish to find out more. and my favourite: “The wall fell down”. It’s important to note that all the original data will be kept (nothing is being deleted!!!). So for example you’ll be able to see that for example, in the original form a user recorded “Everton Football Club” as the funder but that this has been mapped to the concept of a <Private or public corporation>. 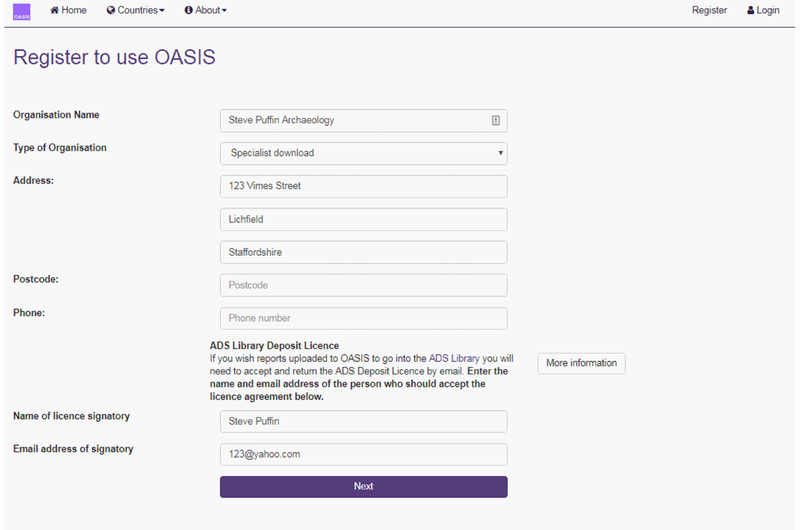 We will also be archiving the complete OASIS database in perpetuity. 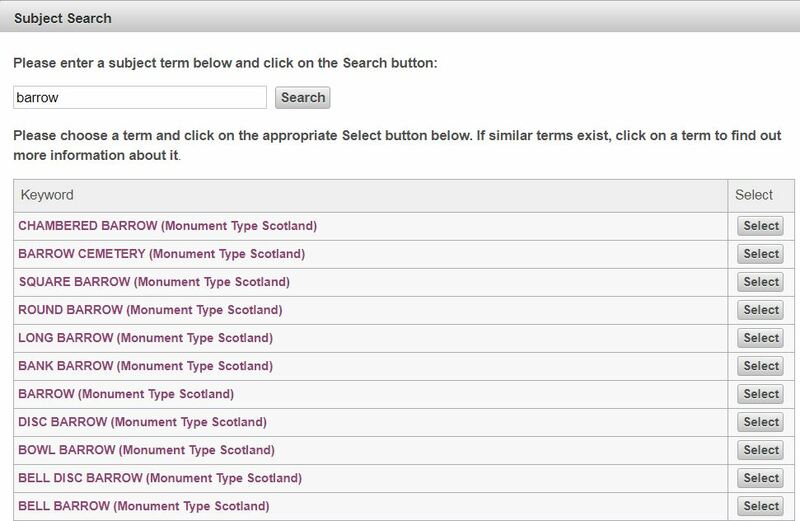 As well as the new lists we’ve also been mapping and migrating standard relevant parts of the form to the correct entries in the more well-established thesauri (monument, event, object, period). As these have been free-text there is a great deal of variety in what and how things have been entered, but my favourite is the person who for object recorded “WOTSITS PACKET”. 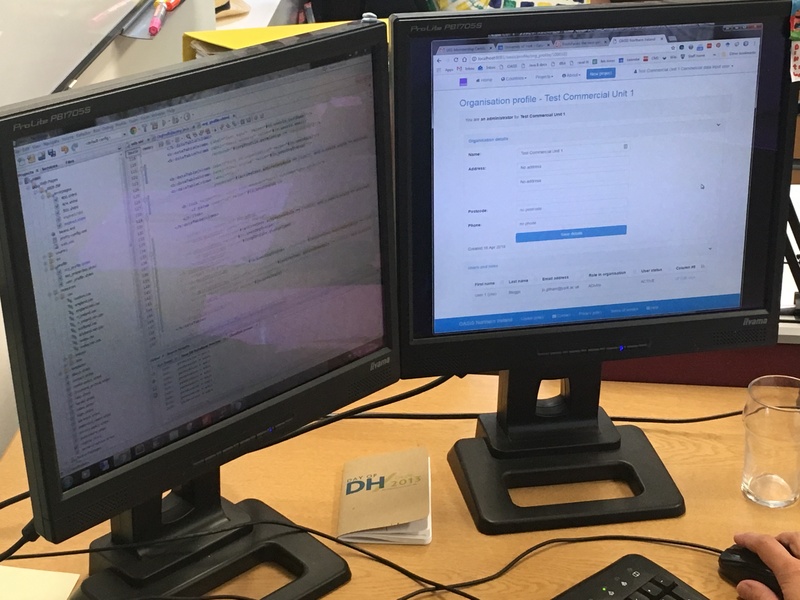 This valuable mapping work is allowing us to migrate records from the old to new database, to help populate the new form and so that everyone’s records will appear when they finally get to logon! This survey is deliberately very simple, and meant to give us a very clear indication of what users want. Answers will be able to be filtered by type of user, country etc so there’s an opportunity for us to identifiy specific tools or resources for specific communities if needed. It should take less than 5 minutes to complete (honestly! ), and no personal data is collected. Please do take the time to fill this in, even if you don’t use the current system. As the new OASIS will be a key component of reporting and information strategies in England, Scotland and Northern Ireland, it really does have a broad remit. Use the chance to make it work for you. In the three months since the last technical report on HERALD Stage 2 (i.e. the build of the new OASIS system), the development team here at the ADS have been working hard. The new database has been built; in a departure from our usual database here at the ADS we’ve decided to use PostgreSQL as our database management system. A whole other blog could (and probably will) be written on why we’ve made this decision, but suffice to say it offers -for our needs – a greater flexibility in terms of datatypes, scale and indexing. Furthermore, via the PostGIS extension it also allows us to store geospatial datatypes, and makes it easy to do many of the location based activities we’ll need to record places simply and efficiently (and a whole lot more besides, but I will save that for another blog). We’ve also – via consultation with ALGAO members – established a criteria and plan for moving records from the old OASIS database to the new system to ensure that no useful information gets left behind. Part of this work package has also been to map ‘bespoke’ terms used in the old/current model to appropriate UK heritage vocabularies, and in this we’ve received valuable assistance from the FISH Terminology Working Group. This last piece of work has highlighted the need for small revisions to existing lists, and indeed for new lists altogether (e.g. 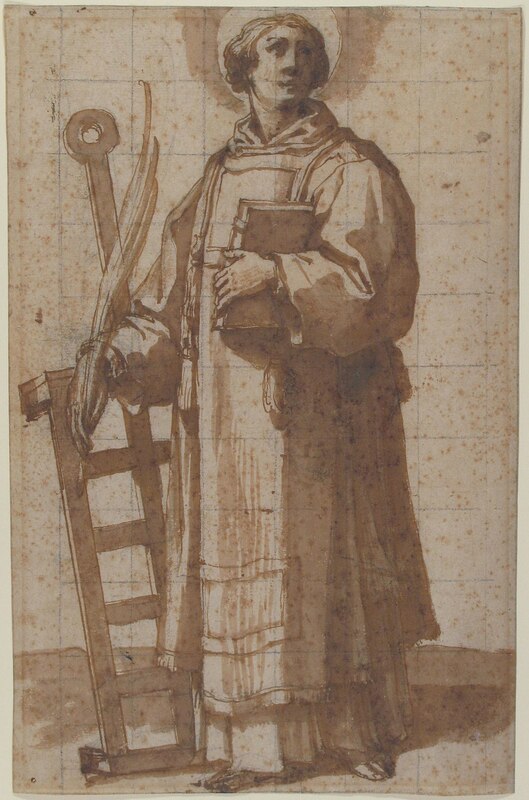 archive component). Over the next couple of months we’ll be finalising these edits and tweaks with FISH, HE and HES, and get ready for a pilot migration of data in the Autumn. As soon as this in finished I’ll report back here, as the level of semantic interoperability built into the new system (including LOD concepts from the BGS and OS) is quite exciting, if you enjoy that sort of thing. The new system is – hopefully – a significant technical and conceptual upgrade on what we have in the older system. For starters, users will be able to log on as themselves rather than via an organisational account. Users will be able to be associated with more than one organisation to reflect different roles people may have in their work/research capacity, and be able to create a new organisation if theirs is not in the system. 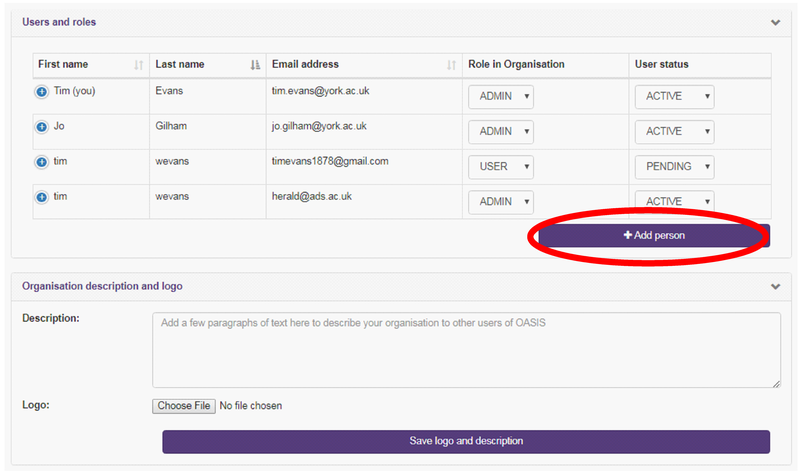 Extra steps are built in to ensure as little duplication as possible, including use of other ADS user groups to equate a user/organisation in that system with the same entities in OASIS. At a slightly higher level, an organisational admin will be able to oversee their group’s members (add and remove), and have the ability to add details about their organisation. The latter will have capacity for Level 2 + 3 users (such as HERs and Museums/Archives) to add reference details on how their organisation is using the system, with space for specific guidance notes for where necessary. Overall, we’re aiming for a simple yet flexible , quick, and well-explained (i.e. on screen guidance) workflow that reflects the feedback we’ve received on how the majority of users want to use the system. We’ll be showing this and other developments as part of timetabled project milestones to the project funders in the next month, and I’ll be reporting back on other significant developments as often as I can.